Like his brother J.D., Bob Beemer was also a television pioneer, but you never saw him in front of the camera. Bob was more of a behind the scenes kind of guy, involved in early television promotion and advertising. To your left is an issue of TV Today. Bob, along with his business partner Bill Diehl, edited the magazine, a precursor to TV Guide. Bob was also Soupy Sales’ manager in the mid 1950s and an advertising executive at M.C. Wagner & Company. 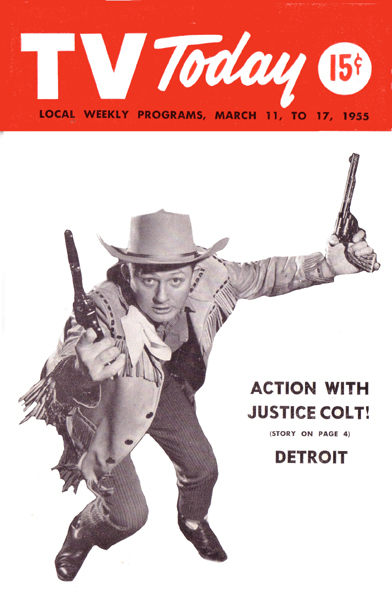 By the way, that’s Justice Colt on the cover of TV Today, with two Colt Peacemakers, ready for action. J.D.’s stepson Earl remembers J.D. telling him that at the photo shoot he banged the hell out of his knees with all of the takes. You have to agree though that it’s a terrific shot.